If you’re a player in my ROSE OF WESTHAVEN campaign, please stop reading now. As some of you may be aware, I’ve contracted map fever whilst running my OSR Midderlands LOTFP campaign; one of the things we discussed in our session zero is that the players wanted to do plenty of dungeon-crawling during the campaign, so I started off drawing a few maps and reading online tutorials. I’m getting to point now where I’m really enjoying working out how the maps link together, to this end I decided to draw a sideview map showing the various elevations and locations of the different dungeon maps in the area around Porthcrawl (our game’s Homebase). I’ve not got round to drawing a finished version yet but have roughed out the layout using Notepad. This post is about an ongoing campaign, so if you’re one of the players in my Rose of Westhaven LOTFP campaign please stop reading now. 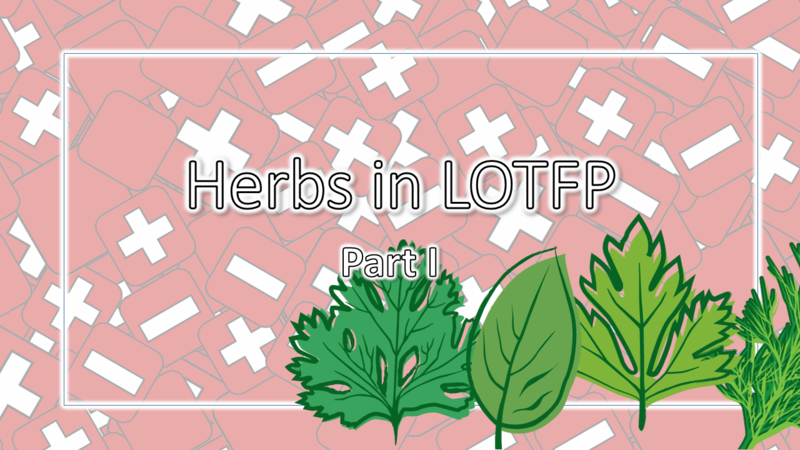 Following on from my recent post on Herbalism in LOTFP–where I took inspiration from the RPG Maelstrom that has an excellent section on using herbs–I decided to start translating some of these herbs into a format that I can use in my ongoing Lamentations of the Flame Princess campaign. I’m a great believer in taking inspiration for background, systems and just about anything really from pretty much anywhere I can get my hands on it, whether we’re talking about writing fiction or preparing RPG sessions. Recently I acquired a copy the Maelstrom RPG, published in it’s current version by Arion Games. I purchase it mainly because I remember reading a review of it in an ancient–and now defunct–UK RPG magazine called Arcane, and because it’s set in a period similar to that I’m running my Lamentations of Flame Princess campaign The Rose of Westhaven in. There’s also a fairly nifty appendix in the book that deal with herbalism and lists the various herbs that are available in the Maelstrom game-world. I’m going for a fairly low-magic/monster-light vibe with my campaign, choosing instead to focus on human evils and shifting alliances. 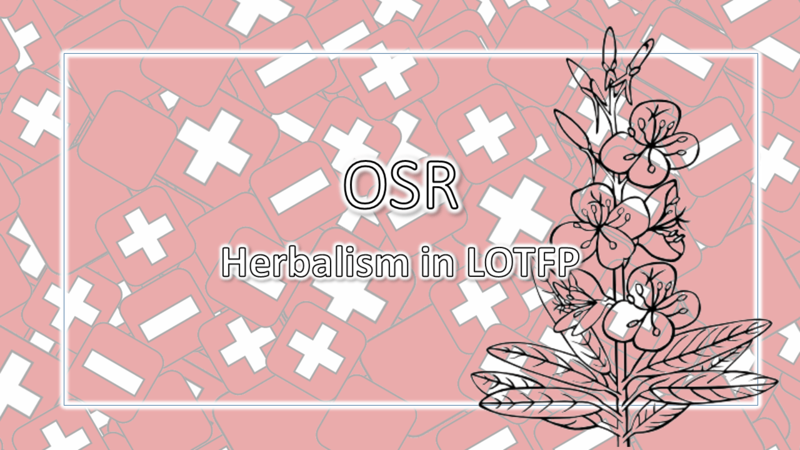 The idea of searching for herbs and preparing them–instead of relying on magic constantly–sounded great for the game. So I put my thinking cap on and started thinking about how I could use them in LOTFP, some of my ideas are listed below. Name: The name of the herb. Availability: The season that the herb is available in. When someone wishes to locate the herb–assuming they are in appropriate environs–they must make a bushcraft roll, however, the roll may not be higher than that listed in the herbs availability, regardless of the characters skill level. Preparation Time: The amount of time the herbalist must spend preparing the herbs before they can be used. Cost in SP: How much in silver pieces the herb costs, the first amount is for unprepared herbs, the second is for herbs that have already been prepared. Uses: How much doses each successful bushcraft roll garners. Effectiveness: When the herbalist attempts to use/apply the herb, they must make a successful bushcraft roll, they may not roll higher than the number listed here regardless of their ability. Effect: What the herb does. All-heale Autumn (4 in 6) 2 weeks 2/10 7 4 in 6 Subject heals at double normal rate. Bishop's Weed Summer (2 in 6) 3 weeks 3/6 3 2 in 6 Cures subject of the plague. Deadly Nightshade Summer (4 in 6) 1 week 4/8 4 5 in 6 Causes to person to fall into a deep sleep for 24 hours. However, if the poisoner rolls a 1 for the herbs effectiveness then they have used too much, the victim gets a save vs poison or they die. Those who survive will be tormented by maddening visions for the rest of their days. English Galingale Spring and Summer (2 in 6) 1 week 1/2 5 2 in 6 Enlivens the sense by increasing the flow of blood. A person who has Galingale successfully applied to them counts as having one additional pip in Search for the next 24 hours, additional doses have no further effect.